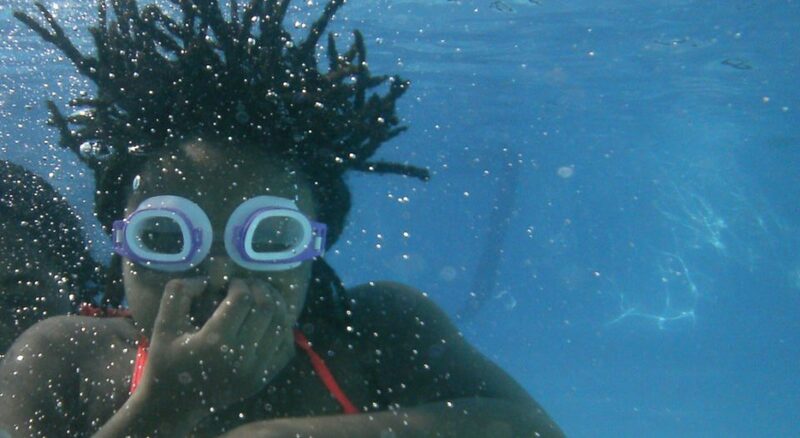 A young camper dives underwater. Along with swimming, Youth Haven campers play games, sleep in cabins, do arts and crafts, and go on adventures in the woods. In places of Washington, D.C., where tourists rarely visit, a quiet epidemic is raging. At least 3 percent of residents—more than 20,000 people—suffer from HIV and AIDS. According to The Washington Post, the HIV incidence rate in D.C. is on par with Uganda and Kenya. Miller-Holland, whose background is in youth and education ministry, was recruited by the social service agency to build up a new program to serve the growing crisis. Today Youth Haven features not only weeklong camps but also teen retreats, family camps, mentoring, and regular field trips and events for youth and families affected by HIV and AIDS. For teens like Samaria (last names of participants are withheld), a 19-year-old who contracted HIV from her mother at birth, Youth Haven is the only place where they can flourish and not keep their biggest secret. Youth Haven’s staff includes Miller-Holland, program manager Dara Yah’ya, social worker Alison Walker and nurse Verena McKenzie. They rely on 40 volunteers and donations from congregations during summer camp weeks. The impact of donated items like decorated medication boxes for the kids and beach towels for swimming impressed Claire Smith, a nursing student who volunteered at a Youth Haven camp last summer. About 10 years ago, Youth Haven staff saw that the camps weren’t enough. The kids went home to families struggling with poverty, violence and drug abuse—stressors that didn’t allow them to focus on their own wellness. So LSS-NCA began to expand program services. During the school year, Youth Haven provides family bonding activities to help youth and parents overcome the isolation and social stigma HIV and AIDS can inflict. Budsies, a company that turns kids’ drawings into custom stuffed animals, sponsored a recent gathering. When the Youth Haven staff surprised Sandra with her Budsie pillow based on her family’s crest, she stood up from her seat with disbelief. “This is so nice,” she said, as she fanned tears away from her eyes and turned the pillow to show the room full of other families. Youth Haven has served more than 500 people since it was founded in 1999. While the HIV and AIDS incidence rate in D.C. has decreased from its peak in 2009, Miller-Holland doesn’t anticipate less of a need for services in the future. “We’re really heartened that babies aren’t being born with HIV these days in the District of Columbia. But we are seeing a rise in HIV infections from teens and young people in their 20s, and it’s very disconcerting,” Miller-Holland said. Beyond the disease itself is the stigma attached to it, which Miller-Holland thinks is where the average Christian can make the biggest impact. For more information, see lssnca.org.